Everyone living right in the heart of New England or out at the farthest reaches of the globe can appreciate the beauty of New England. 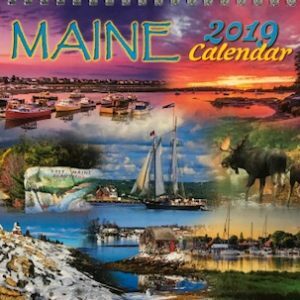 Whether it is a Vermont winter's snow covered firs, a Maine seaside's brilliant summer sunset, or a church steeple amidst the vibrant fall foliage of New Hampshire's mountains, this 12-month calendar will be sure to enliven anyone's taste for nature's splendor. Includes next year's calendar and moon phases for every month. Sturdy paper stock and a thick spiral binding make the quality of this calendar in a league of its own.